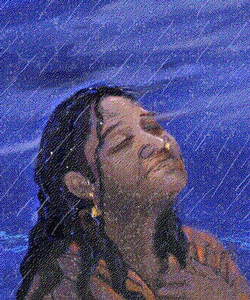 Sublime as it was, Krishna Bhava was not the culmination of Sudhamani’s sadhana (spiritual practices). 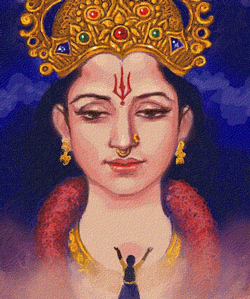 One day, soon after the advent of Krishna Bhava, She had an unforgettable vision of Adi Parashakti (the Primordial Power, or the Divine Mother). So enrapturing was the vision that Sudhamani yearned with all Her being to become one with the Divine Mother. 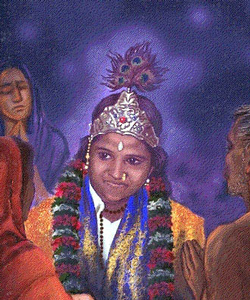 Sudhamani’s elder brother, unable to comprehend Her exalted state, chastised Her terribly. One day in a fit of anger because of the gatherings around his sister, he threw Her out of the house. From then on Sudhamani lived outdoors by Herself. 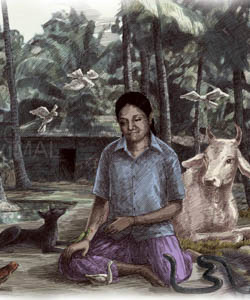 Now, when Sudhamani was living outside, it was the animals who looked after her and became her close friends. Her family had more or less abandoned her and were against her spiritual life, but the animals adored her and did their best to make her as happy and comfortable as possible. No matter what the weather, they always stayed close to her and protected her. The animals seemed to understand her much better than any human being ever had. 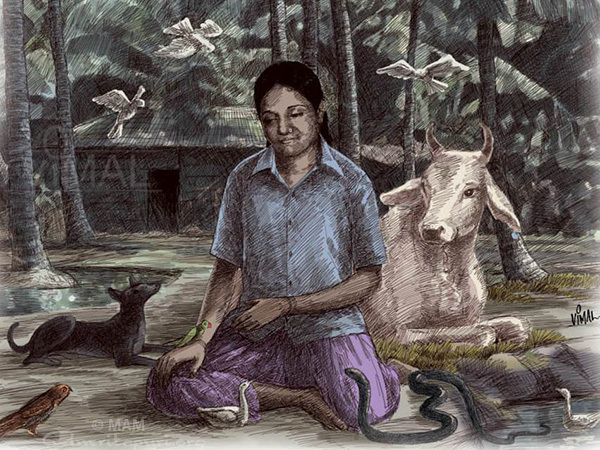 Animals brought food for Her–an eagle dropped fish into Her lap; a family cow each day presented its udder to Her for milk; a dog brought packets of food–and watched over Her in Her deeper states of meditation and longing. Unable to bear the sight of Her suffering, several animals were seen to shed tears watching over Her. 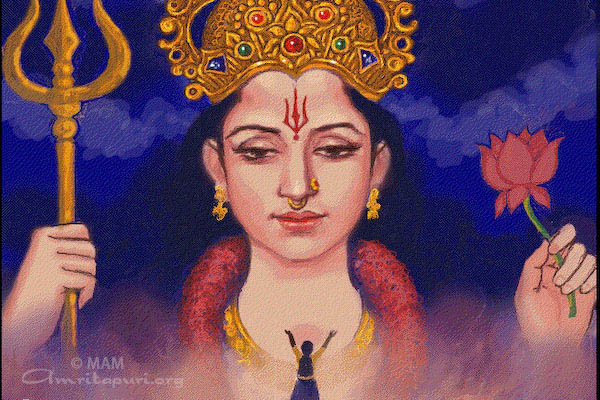 Sudhamani’s longing for the Divine Mother became so strong that she could no longer think about anything else. She didn’t take care of herself or notice anything around her. She no longer knew the difference between day and night. She lay on the ground in a state of deep meditation. 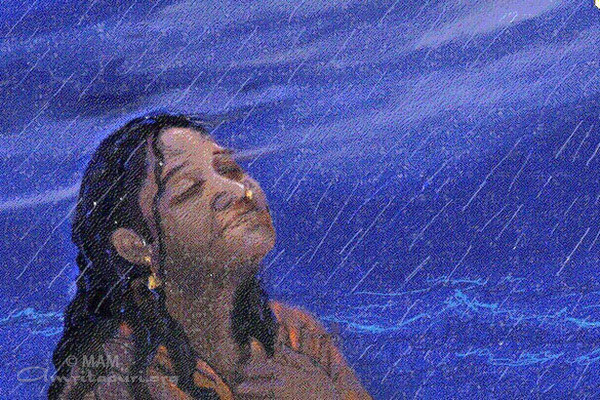 She didn’t notice when the sun was burning hot or when it poured with rain. Her consequent transcendental union with the Divine Mother is poignantly described in Her original bhajan, Ananda Veethi.